The Saddest Truth I've Ever Put In Print! "One of the hardest things for me to learn – or, should I say, "accept" – is the fact that fundamentalist preachers put on their britches one leg at a time. By that, I simply mean that they have a fallen human nature and are capable of the same kind of sins the rest of mankind practice on a regular basis. They do not go to Heaven every night and come back every morning to be of service to God and humanity. In my naiveté, I somehow supposed that the children of liberals could grow up to be rebellious, ungodly and enemies of the faith – but not the children of fundamentalists. I had no problem understanding that liberal preachers could leave town with their secretaries or choir leaders, but never, never a fundamentalist minister. If a newspaper headline revealed an account of ministerial financial shenanigans or absconding with funds, I automatically considered such a man a liberal – because a fundamentalist couldn't do anything like that, of course. Later, as my eyes became accustomed to the reality of the world's light – or, rather, darkness – I had to admit that Bible preachers could commit the same identical sins as did some of the infidels in the pulpit. Even then, in my mind, they were the "New Evangelicals." fundamentalists would never do anything like that. Alas, the days of my "sweet innocence " long ago evaporated like fog under the burning morning sun. There is nothing a fundamentalist – out of fellowship with his Master – cannot do. This covers the range from stealing a postage stamp out of another's desk to adultery and murder. Murder? Yes, I recall hearing the late Bob Jones tell of a minister friend (a man for whom he had conducted evangelistic services) who was charged with murdering a woman in his church; it seemed they had an affair and when it was about to be exposed, he killed her. I recall how shocked I was when Jones told the story – and how I thought to myself, "No, he couldn't have been a saved man. He may have professed, but he surely didn't possess. " Yet David was a saved man when his sin was about to be exposed and he connived the killing of his lover's husband, Uriah. We would be wise to take heed! The truth is that Schaap didn't fall from anything. A cursory glance at his doctrine and deeds over the last eleven years would have revealed to any discerning Christian that he was a false prophet, a wolf, a viper, a dog, and an evil worker. Those are Biblical words. It is sad that he used the name Baptist but he was no more a Baptist than was Balaam. It is sad that he hurt many people and has misrepresented Christianity, but his preaching and practice plainly evinced that he was never what he claimed to be. Second, it is troubling that so many refuse to acknowledge the obvious fact that Schaap was the product of the belief and behavior of his father in law. If Scripture is our authority then we must agree with it in its condemnation of the preaching and practice of Jack Hyles. If you don't know what I'm writing of, then it is time to do your research for Hyles has been a major influence in leavening Baptist churches. You have no excuse for remaining in ignorance if you have read Matthew 7, Acts 20, Philippians 3, I and II Timothy, Titus, 2 Peter 2, I, II, III John, and Jude. It is time to apply those passages where they need to be applied: the NT churches of the Lord. Those warnings concerned men who would operate among NT churches. The men who have continued to promote the influence of Jack Hyles need to repent. These include Jack Trieber, Tony Hutson, David Gibbs, Paul Chappell, Clarence Sexton, Jeff Fugate, Doug Fisher, and Keith Gomez. Some of them have roundly condemned Schaap in recent years but they still have promoted the root of the fruit that is Schaap. Didn't Someone tell us to either make the tree corrupt or make it good? Some of them have broken from Schaap but have not sounded a clear warning as to why they ceased fellowship with him. Their silence has been deafening for the last several years. It has contributed to him having the influence that he did have until his recent exposure. Clarence Sexton was implored by many brethren to not promote Jack Schaap. He ironically criticized the criticism but pressed on with his newfound "friend" until last week. Now one can search all of his websites in for his friend and it is as if Schaap never existed. The filthy doctrines were excused, but at least there was a standard somewhere concerning when to not be friends. With the light of Scripture shining on the "ministry" of Hyles, with that torch revealing the depravity of his writings, sermons, and conduct, how can any discerning Christian continue to follow his footsteps or walk with those that do? It is time to get to the root of the mess that is Hammond. Be separate from all that smacks of the least influence of Hyles. Let us cling to true New Testament preaching and practice. Abandon the man made movements and machinery. Pursue purity as individuals and as churches. I thank the Lord that, by his grace, I was never in the Hyles movement, but I grieve that so many are to one degree or another. This is what most troubles me about the Schaap debacle. It is truly the Hyles mess and so many are still involved in hylesism who may not be if it were not for the political preachers who refuse to confront it Biblically. I am thankful for grace and true Biblical fellowship. I thank the Lord that there are still some who are separated unto the Lord. May God help us to stand with grace and truth. The myth that a man of God fell is now continued by Pastor Clarence Sexton. I do not joy in this. It is grievous. There is still no acknowledgement of the false doctrine and practice that Jack Schaap promoted. There is no repentance of fellowshipping with and promoting a false teacher. There is no turning from the false idea of unity. These are dark days. Independent Baptists need to deal with sinful teaching and practice in our midst. We pastors need to turn the churches we are leading away from any influence of false teachers no matter what label they wear. The warning passages in the New Testament deal with men who would come in among the NT churches. When will we understand this? So much time is spent exposing the false prophets that are totally outside of the Lord's assemblies while those that are operating amongst His churches are not marked. Joel Osteen and TD Jakes are roundly condemned while the certain men who have crept in among the flocks of Jesus are given a pass because they wear the IB team jersey. This style of separation is like a man railing against the border issue in Arizona while doing nothing about criminals who are pillaging his own house and abusing his wife and children. I fear the Schaap issue will only be treated as a moral fall. The doctrine and practice was un-Godly long before the sexual perversion was known. When will it be repudiated by FBCH, David Gibbs, Clarence Sexton, Jack Trieber, et al? Is sexual immorality the only sin that Baptists cry out against anymore? Is false doctrine no longer worthy of our rebuke? The root issue is the false religion of Hyles that has permeated, to one degree or another, a tremendous number of IB churches. His religion included: a gospel that removed the Lordship of Jesus Christ, un-Scriptural understanding of genuine repentance and faith, the elevation of men, a false view of success, a use of cheap gimmickry in building churches, un-Biblical preaching, emotionalism, false sanctification, false doctrine of the Holy Spirit, so called conversions without any change . . .
May God help us to be purged of these wicked doctrines and deeds and get back to the Bible as our sole authority for faith and practice. The Saddest Story We Ever Published! Click on a chapter below to view it or download all chapters for printing (requires Adobe Acrobat). Chapter 1 - Introduction by Voyle Glover, Esq. 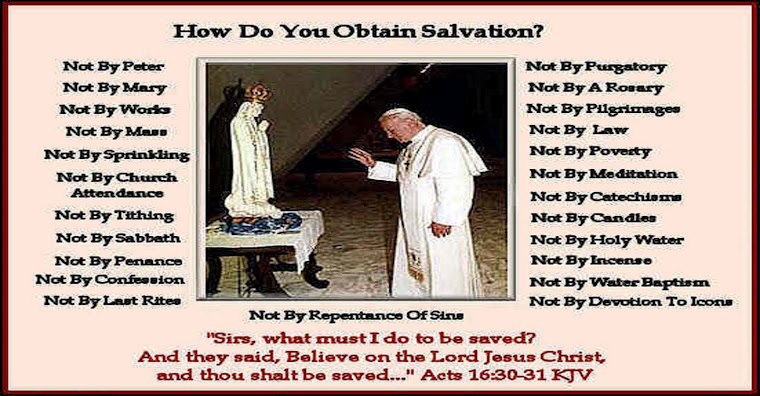 Click picture for God's way to be saved! Read what one must do to be saved.